Rowenta steam irons are some of the most recognizable and best-selling units on the market, and the Rowenta DW5080 is no exception. The powerful 1,700-watt unit offers numerous impressive features including automatic shut-off, self-cleaning capabilities and anti-calc ability. Its precision tip allows you to get into the smallest spaces of your clothing while anti-drip helps you avoid wet messes. Like many other Rowenta irons on sale, this model can be used for vertical steaming as well. Its special precision tip is specifically made to get into tight spaces. It’s smaller than the tips of most irons. The steam output on this model beats many others mentioned in steam iron reviews. It features 400 steam ports to enhance your straightening capability. Because of the enhanced steam output for this unit, the steam runs out much faster than that on irons with less output. 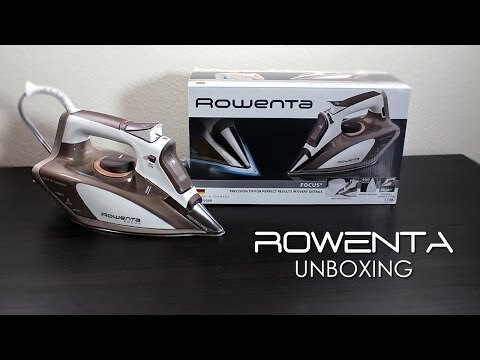 Even though it has a large 10-ounce tank, users in Rowenta iron reviews have complained about having to repeatedly refill the unit during ironing sessions. Some users feel the 3.4-lb weight to be too heavy. The Rowenta DW5080 features a precision tip that glides the iron into the tough areas of your clothing such as in-between buttons and around collars. Every part of the plate, including the tip, is lined with steam ports that allow you to easily smooth out your wrinkles in all areas of your clothing. There are 400 steam ports in total on this Rowenta Focus iron to allow for even steam distribution, and they are spread out across the center, top and bottom for simpler ironing. The sole-plate on this model is scratch-resistant and made of stainless steel. It has an aluminum core that facilitates even heat distribution across the plate, and its polished finish allows the iron to glide smoothly over your garments. The rounded bottom of the plate helps prevent you from creating accidental creases when you move the iron across the fabric. The Rowenta Focus features a thermostat knob right above the water tank. It features specific settings for five different fabrics including cotton, linen, silk, nylon and wool. The self-cleaning feature helps flush out build-up, and the anti-calc feature has an anti-scale system to remove substances and maintain the unit’s performance. The Rowenta iron has a steam control lever, steam jet and spray mist button to help improve the straight press of your clothing. The water tank can hold up to 10 ounces of water, and even tap water is safe to use with this Rowenta model. The safety feature that users mention the most in Rowenta irons reviews includes automatic shut-off. The unit powers off if left idle for 8 minutes when used vertically and 30 seconds when resting on its sole-plate. If this safety feature isn’t quite safe enough for you, you can always opt for the longer time window of the Panasonic NI-W810CS Multi-Directional Iron that cuts of at 10 minutes vertically and 60 seconds on its plate. The Rowenta DW5080 is a solidly-built iron with reliable performance. Considering its performance, the Rowenta DW5080 has the best price of many irons in its class. With features like the Rowenta iron cleaning capability, this unit is definitely worth consideration.